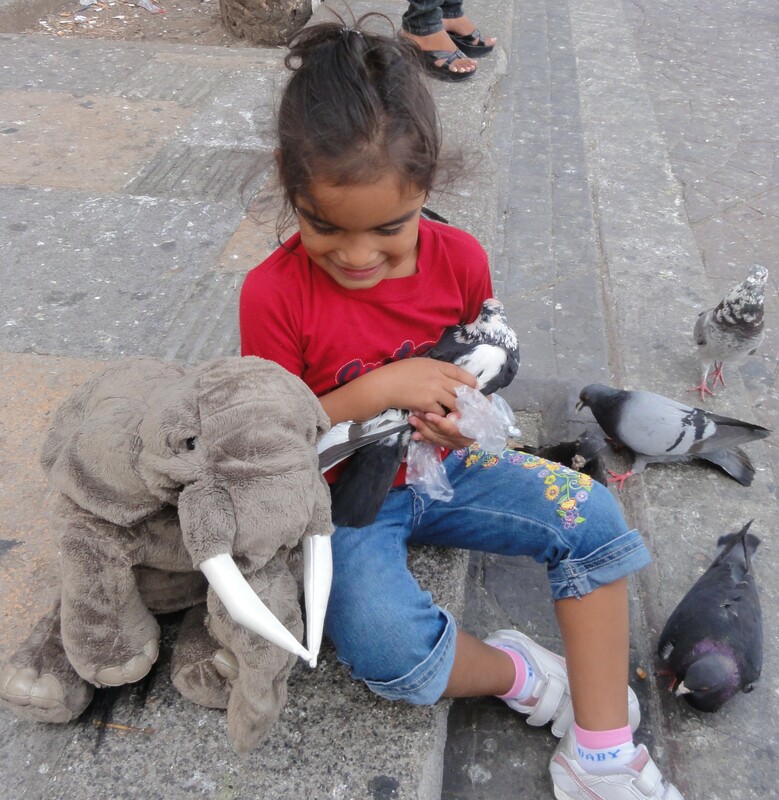 Trypp enjoying people & pigeons in San Jose's Plaza de la Cultura. Trypp became Judy’s travel partner in March, 2011. Their first trip together was a Wind Star Cruise along the Pacific Coast of Costa Rica and touring the interior for six days from San Jose. Her contribution to the partnership includes escorting group travel and marketing. Most importantly Trypp accompanies Judy on her journeys, contributing to the interaction with the local populace and recording their travel adventures in her breed’s noted elephantine memory for later publication in the Traveling Elephant blog. tradition remains active today with the elephant participation in the annual Great Migration on Africa’s Serengeti Plain. An African Elephant by design, Trypp was conceived at Folkmanis Puppets in Emeryville, California, and like most elephants claims to “never forget.” Her education includes a travel apprenticeship under the tutelage of the matriarch of her herd. An inveterate traveler, Trypp considers the world her family. Her interests include walking on the wild side, collecting recipes using peanuts, and solving pelmanism puzzles. She is a card-carrying member of the World Wildlife Fund as an endangered species.